Come and get away in the perfect cabin rental in Blue Ridge, GA! Wood Haven Retreat is a brand new cabin, and is very quiet and secluded. Wood Haven Retreat boasts mountain views, has the rustic touches that you love, but all the conveniences and upgrades from home. This North Georgia vacation rental is perfect for the whole family, just the two of you, or three couples. 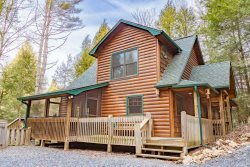 Outside around the cabin you will be amazed at the gentleness of the land and with a great and easy access to the private fire pit you will certainly feel like you are in a "quiet and serene" setting, all of this but only 5 minutes from Downtown Blue Ridge. When you first arrive at Wood Haven Retreat you will enjoy the that it is a very scenic drive, yet only a few short minutes from Downtown Blue Ridge. You may also access the famous Benton McKaye Trail, one of the longest spurs off of the Appalachian Trail, which is less than five minutes from the cabin. Also at the cabin, have fun while roasting marsh mellows or hot dogs over the open fire, take time to breath in the fresh Blue Ridge Mountain air. Woodhaven Retreat is located about five minutes from Downtown Blue Ridge, and has very easy access by most any vehicle. The cabin is only about 3 minutes away from the grocery stores but a long way away from all worries. The cabin sits in a private area and does not have any immediate neighbors. The surroundings are all wooded and provide the perfect backdrop for a Blue Ridge Mountain Cabin getaway. Cabin was exactly as pictured. The balconies off the bedroom gave me privacy to enjoy the view while not disturbing others. Such an amazing vacation and experience. Just what everyone needed at the end of a long year, it was nice being able to relax and stay inside the cabin without ever getting bored because of the amenities! Also, the views and peacefulness were incredible. Wood Haven Retreat was everything we dreamed it would be and more...a perfect get-a-way! Pleasant. Employees were extremely helpful and courteous. Comfortable. Very nice cabin and close to Blue Ridge. Our stay was way to short this time, we cannot wait to get back to this cabin and the area. Blue Ridge is great, and this cabin is absolutely perfect for our family, and the location is wonderful. You feel like you are out in the woods by yourself, but only five minutes from town. Its perfect, thanks for another great stay Georgia Mountain Cabin Rentals. The whole process from booking to check out was a wonderful experience. This will be our go to company from this point on. The cabin was beautiful, everything was just as described. The cabin was very clean and well kept. Very good. I would refer other people to this property. Our stay was perfect. The cabin had everything we needed for 3 couples to stay for 1 week. The staff was extremely friendly, and helped to accommodate our every need. We stayed in this property for several months while our house was being built. It had great space, great privacy, and was very close to town. We enjoyed our "stay"cation since we had not stayed in a cabin before, but this was wonderful. We enjoyed the views, the hot tub, pool table, and the large basement area for tv watching as well. The kitchen was great for cooking and bedrooms had tons of space! Our stay at Woodhaven retreat was wonderful. We had a small family gathering for several days and could not be more pleased with the property or the people at Georgia Mountain Cabin Rentals. We had a lovely time and the cabin was absolutely wonderful. We wish we did not have to leave, we extended our stay once and would have loved to again. The cabin is decorated wonderfully and was very comfortable. We cannot wait to make a return visit. The staff was excellent, very attentive and willing to help. Cabin was perfect and we enjoyed every minute. Well appointed and very clean. Thanks for another great stay. The cabin was great. We loved the pool table and hot tub. We liked the fact that there was a tv and DVD player in every room. Team was very friendly and great to work with. Communication by email was perfect, very detailed. Cabin was only minutes from downtown so the location was great. Wood Haven was spotless and had everything we needed. This cabin is wonderful! Company was great to deal with as well. You can't go wrong with staying at Wood Haven or dealing with Georgia Mountain Cabin Rentals. I, rather we enjoyed the trip immensely and look forward to the return. We have been visiting Blue Ridge for years and have been renting cabins from Georgia Mountain Cabin Rentals the last several years. The staff is very friendly and accommodating and has a wide variety of cabin rentals to meet every need. I would not hesitate for a second to go back and stay! This cabin actually exceeded my expectations. It is perfectly planed out, floor by floor. CLEAN! I could not believe that this cabin was out in the woods. From the outside to the inside this property is very well maintained. Not even a cobweb. The hot tub was so relaxing. The fire pit with enough chairs for everyone. Sitting on any of the 3 decks in the rocking chairs. The silence. Very, very relaxing. I cannot wait to go back! Loved Blue Ridge & Ellijay. Woodhaven Retreat was a beautiful cabin. Not sure when it was built, but it was like new. We arrived on a Friday evening, picked up our key and followed the detailed directions to the cabin. At first I was afraid the location might not have been as secluded as we would have liked, but after passing a few "regular houses" we were quickly immersed in the middle of the woods as we approached our cabin. As we got unpacked that evening, it was getting a little warm and muggy inside. I checked the thermostat to find that the A/C did not seem to be working properly - the fan wasn't blowing. I didn't feel it was bad enough to bother calling after hours service, so we decided to just open the windows and make the best of it until we could contact the office when it opened in the morning. It was about the same time I noticed there was no carafe for the coffee maker. I'm a big time coffee drinker so that bothered me a little. Thankfully, there was a large measuring cup I was able to use in a pinch the next morning to get by. We drove into town and stopped by the office on our way to the Arts Festival. We were greeted by a very nice lady and I explained our issues. She was apologetic and very eager to help! After spending a couple hours at the festival, we returned to the cabin to the A/C working great and shortly after that, the same nice lady from the office showed up at our door with a brand new coffee maker! You just can't beat that for service. Besides those minor hiccups (which were promptly and painlessly resolved), our entire stay was wonderful. Roasting marshmallows at the fire pit, soaks in the hot tub, numerous games of pool and darts with my daughter, rocking in the rocking chair drinking coffee on the back porch watching the sun rise.... we simply couldn't have had a better relaxing family weekend. We do long weekends in Blue ridge every 4-6 months and typically try a new cabin each time. I will be hard pressed not to book Woodhaven Retreat from Georgia Mountain Cabin Rentals the next time! Overall satisfied with our stay and the staff at Georgia Mtn Cabin Rentals. We travel with another couple and always select accommodations with full service kitchens, common sitting area and multiple bedrooms. Wood Haven Retreat is set in a private location; very peaceful. Fire pit and jacuzzi was perfect after a day of golf. This cabin is perfect for relaxing in any season. amazing cabin!!! Spacious and loved every inch of it. My favorite room was the "man cave" downstairs with the pool table, darts, and dvd player. I will definitely return.